Ground Penetrating Radar (GPR) works by pulsing electromagnetic waves into the ground, measuring the strength and time delay of the returning signal. This allows the approximate depth as well as the density of the buried object to be estimated. Typically, GPR will be used on sites ranging from highways, roads, pavements, gardens, courtyards, car parks and derelict land through to floors of churches, basements and graveyards. Building structures can also be investigated using higher frequency antennas. Are there any misconceptions about the differing techniques? Yes, we often find that because the High-Density Ground Penetrating Radar offers a range of benefits compared with standard Ground Penetrating Radar. Including improved speed, accuracy and cost. It’s often seen as 'the better of the two offerings'. However, this is usually not the case and dependent upon the target anomaly, it may not be the most suitable survey technique for your site area despite the benefits. What are the applications of Ground Penetrating Radar? The technique can be applied to a variety of sites. There are no real 'hard and fast rules'. The choice of the best equipment is ultimately determined by what the client hopes to find, as well as the size of the survey area. At SUMO we will often make this decision for the client based on our expertise and experience. In geophysics, we normally use a High-Density Ground Penetrating Radar when looking for as much detail as possible. Typically use this on sites such as a Scheduled Monument, research projects, or sites where the client expects to see multiple features such as archaeology, buried services, depth of deposits, voids or obstructions. Even stone coffins, all at once. However, in our experience, a standard GPR would also be ideal for an archaeological evaluation. In which the aim is to trace the line of a wall, or the outline of a building. Similarly, it is also ideal for a utility survey, where the aim is to trace buried utilities and find their depths. Conversely, if we are looking for very shallow features (such as rebar) or very deep features (such as culverts or Victorian drainage pipes) we would use a single channel system with an appropriate antenna. Mid-range features would see us use a High Density or Dual Frequency antenna. We research as much as we can about the site, its history and what we are looking for to aid this decision. Are there any limits to the technique? 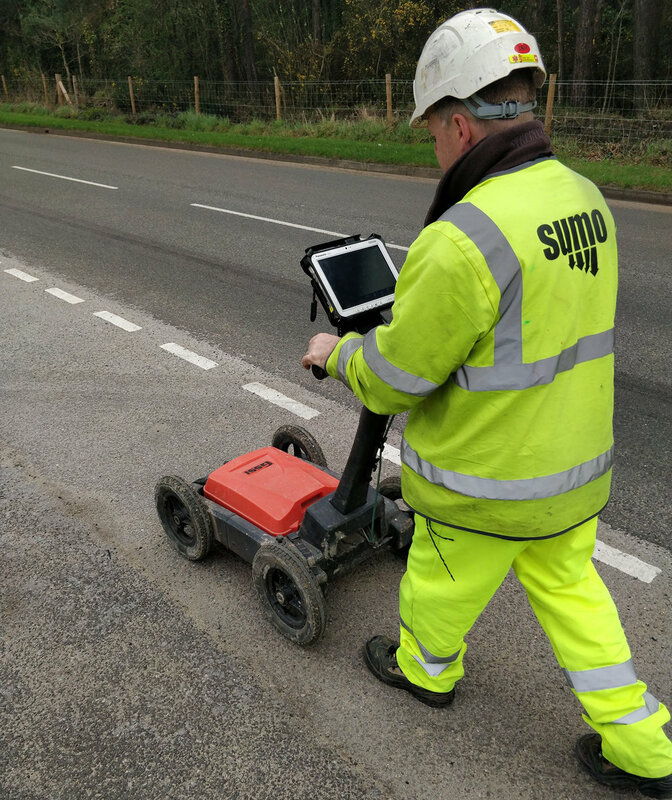 Ground Penetrating Radar can ‘see’ through a vast variety of surface materials such as tarmac, concrete, brick, stone floors and walls. On the other hand, it is of very limited use where there is a layer of clay soils. This is because the clay soils absorb most of the electromagnetic waves emitted by the equipment and distort the data. The base of the Ground Penetrating Radar equipment must be within close proximity of the ground in order to transmit the electromagnetic waves. Therefore, the smoother and clearer the survey area, the better the data. This is not to say that surveying such areas is not an option. It is simply that the equipment performs better on good site terrain. What does Ground Penetrating Radar data look like? This is an example of data collected by a High-Density Ground Penetrating Radar survey over a Roman Fort. The High-Density GPR was ideal for this site and allows us to see multiple features all at once. In this case, the archaeological structures and the buried utilities. This is an example of 3D data collected by a standard Ground Penetrating Radar which was ideal for this site in which the aim was to trace the outline of a Roman Villa. The data examples above are of processed data which has been collated to form the above images. The raw data is collected in Radargrams, which are a horizontal abstracts at estimated depths. So, what are the big differences between each system? They are ideal for discovering mid-range features. High frequency antennas have a high resolution. They are suitable for shallow depth of penetration and are ideal for discovering shallow features such as rebar. Low frequency antenna have a lower resolution. But they can penetrate to much deeper depths and are ideal for discovering deeper features such as culverts or Victorian drainage pipes.